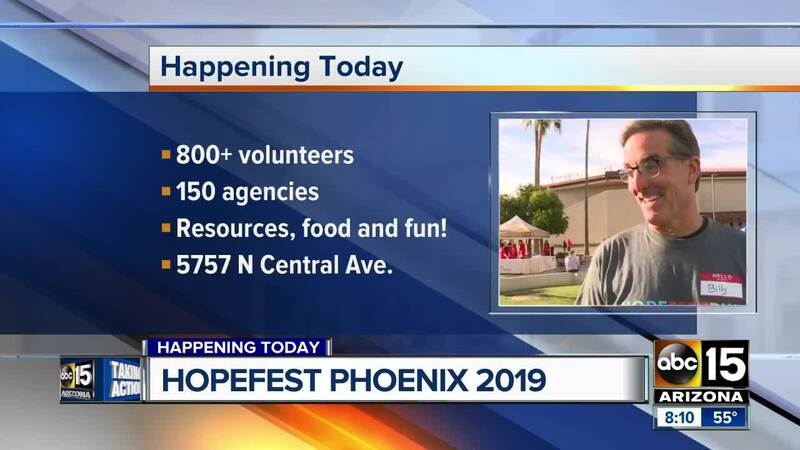 HopeFest Phoenix is hosting their annual event to help people around the Valley with a variety of needs. PHOENIX — Hundreds of people are coming together Saturday to help those in need in the Valley. HopeFest Phoenix will take place at the North Phoenix Baptist Church from 9 a.m. to 2 p.m. on March 23, 2019. With the help of more than 800 volunteers and 150 service agencies, individuals and families can get the help they need in a variety of different areas -- healthcare, addiction recovery, dental services, education, employment, child welfare information, foster care, housing, refugee assistance, human trafficking prevention and intervention, tax preparing and more. Groups that will be at the event include Phoenix Rescue Mission and various non-profit groups that specialize in education, health, government, faith and more. Together, they have a simple goal: "meeting the needs of the community by connecting them to long-term resources." HopeFest promises a lot of fun, too. They say there will be bounce houses, face painting, music, dancing and food. The annual event started in 2012 and has helped more than 100,000 people since it began.